Teeth play a critical role in chewing food for the proper absorption of nutrients by our bodies. It is essential that we take good care of them for overall health. Habits such as eating junk food, smoking, and drinking alcohol wreak havoc on our dental health as much as neglecting standard daily oral hygiene. Going to the dentist on a regular basis (twice a year) is an essential preventative measure that will ensure that your teeth stay healthy and strong. Most first visits with a dentist include a dental exam, radiographs (x-rays) and a dental cleaning. An examination and radiographs will help the dentist identify disease of the gum tissue (gingivitis or periodontal disease) and tooth decay. Tooth decay often creates no pain until it reaches the nerve of the tooth and patients often do not realize it is there. An exam every 6 months can quickly identify problem areas and often can be addressed in a quick and conservative manner. If gum tissue appears relatively healthy with no loss of bone support or gum support, a preventative (prophylaxis) or simple cleaning can be done. These cleanings will remove all tartar and plaque above the gum tissue and no greater than 3 mm below the gum tissue. Patients with bone loss, excessive build up with loss of gum attachment often require a different type of cleaning or periodontal therapy. Deep cleanings (also called scaling and root planning) are services we provide patients who are diagnosed with periodontal disease. Patients with complex health histories, a history of smoking or no maintenance for several years, may be candidates. This will be evaluated and discussed by your dentist. The general dentistry services that we provide at Katy Oaks Dental will help you maintain and care for your teeth and gums. We are also able to provide competitive, complex restorative solutions to individuals seeking to improve the cosmetic appearance of their smiles. A crown may be suggested, whenever a tooth is missing a cusp or more than half of the tooth structure. Other candidates for a crown often include teeth that have had root canals or teeth with fractures or cracks. Worn teeth can also benefit from a crown. A crown, which is also sometimes called a cap, is a permanent restoration that completely covers what remains of the natural tooth. A crown is cemented in place and completely encases the whole tooth at and above the gum line. Crowns help to restore function as well as restores the tooth's beauty. Dentists also cement crowns to dental implants or secure a bridge in the correct location. The crowns are often necessary in cosmetic modifications when a veneer is not an option. The dentist determines when this treatment option is the best solution for a patient's needs. The first visit involves the preparation of the tooth for the crown. The dentist numbs the tooth and reduces it down to make space for a crown or builds it up, if the tooth has significant decay. An impression of the tooth is made, this impression is then sent to the dental lab for the crown to be made, and a temporary crown is installed until the permanent crown is ready. Most labs return a permanent crown in 10-14 business days. Crowns generally last approximately 5 to 15 years. This depends on wear and tear on the crown, oral hygiene and more. Individuals must remember that the tooth is still prone to decay, thus brushing and flossing remain of great importance. In addition, grinding of the teeth, biting fingernails and chewing ice can all impact the life span of the crown. A bridge is just one way to replace missing teeth and is a permanent restoration that is cemented in the mouth. Several teeth can be replaced with a bridge. A bridge requires one tooth in front and one tooth in back of the space (anchor teeth) to be fabricated. The anchor teeth are similar to crowns as they cover the teeth. They are the connectors that will support the area to be filled in. Shifting of the teeth that can lead to bite problems (malocclusion) and/or jaw problems. Our cosmetic dentistry services can provide the results you are looking for! We understand our patients' needs and we will make every possible attempt to accommodate your schedule and your concerns. Cosmetic dentistry can help you dramatically improve your appearance. There are a number of common cosmetic procedures that can be performed to improve your smile appearance. Veneers can become an important part of your smile solution. Crown, bridges, and implants can also be used to restore a beautiful smile (please see more detailing for these services). Veneers are a great aesthetic solution to your smile that may even help you avoid orthodontic treatment. Subtle changes to your smile can be achieved with veneers. Veneers provide a natural looking smile, resist staining and are ideal for improving the appearance of your teeth. We can't wait to help you improve your smile and increase your confidence! If you lack the confidence to smile, speak, laugh, eat, and enjoy life because you have missing teeth, it is time to consider the dental implant option to restore your smile to its original luster. Dental implants make this possible, as they provide a foundation for teeth that are no longer able to function as intended or have been lost. A dental implant is used to replace missing teeth often lost by trauma, dental decay, or bone loss. Dental implants can replace a single tooth or multiple teeth. An implant requires the placement of the implant in the bone by a surgeon. After healing, a post called an abutment and a crown is fabricated to restore chewing function. An implant and implant crown are permanent restorations in your mouth and can restore the natural beauty of your teeth lost. These implants look, feel, and function as natural teeth, allowing the person to smile and eat once again without feeling embarrassed. Patients often desire whiter teeth to brighten their smile. If a front crown or veneer is needed on a tooth, we often recommend bleaching your teeth prior to new porcelain restorations. Bleaching procedure is recommended prior to any cosmetic dentistry procedure. Bleaching or lightening of the tooth enamel can be done either at the office or at home. Office bleaching requires about 1 ½ hours of time in the office. Patient often lighten 5-6 shades from their starting color. Home bleaching can be accomplished by wearing trays in the mouth. Bleach is applied to the trays daily until the desired color is achieved after 10-14 days of use. This process is one of the simplest and most affordable ways to make a dramatic cosmetic improvement to your smile. Orthodontics is the dental procedure used to straighten teeth. Clear braces (commonly known as Invisalign or Clear Correct) can be used to not only straighten teeth but prevent future damage of the mouth. Teeth that do not fit well together can create damage not only to the teeth but also to the gum tissue, bone support and jaw joint. Misaligned teeth can also contribute to snoring, sleep apnea, or grinding. Treatment can often take 6 months to 2 years depending on the required movement. Teens and Adults of all ages can benefit from clear braces. For patients with higher anxiety levels, sedation helps alleviate these unpleasant feelings and improves the experience patients have during dental procedures. 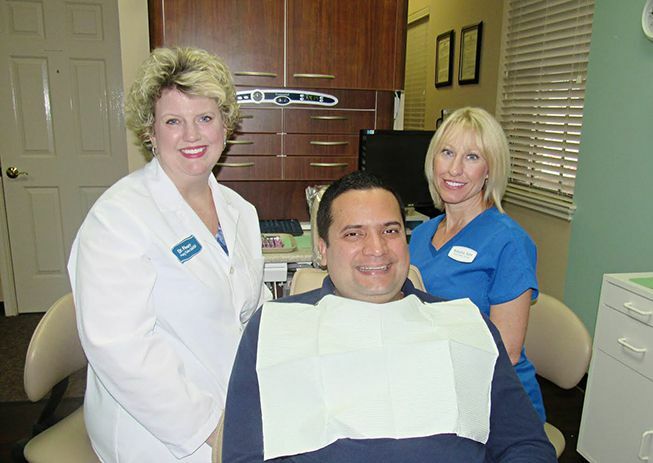 Sedation dentistry uses medication to help patients relax during dental procedures. At Katy Oaks Dental we offer 2 types of sedation: nitrous oxide and oral sedation. Nitrous Oxide is also known to many as laughing gas. When nitrous oxide is inhaled through a mask it can make people feel euphoric and relaxed. This colorless and non-flammable gas is often used to reduce anxiety in children and adults for a number of procedures. Nitrous oxide is easily administered chairside and it can be removed from the patient's system with a 5 minutes follow up of 100% oxygen. Oral Sedation is mostly useful for appointments where extensive dentistry is being performed in patients with higher levels of anxiety. Drugs, such as Valium, can offer a deeper level of sedation for patient. These oral medications can also be used safely in conjunction with nitrous oxide to give the patient an even deeper sedation if necessary. Night guards are beneficial when there is excessive wear on teeth associated with bruxism (grinding) at night. Patients will often experience pain in their upper jaw area and sometimes notice chipping or cracking in the front teeth. Grinding can lead to these problems. A night guard is a flat planed acrylic mouth piece that fits snuggly on either the upper or lower teeth. It prevents the teeth from rubbing on each other throughout the night. Night guards also assist with protecting teeth on people who clench. Athletic guards are often recommended for many sports such as martial arts, football, hockey, and basketball. Anyone who participates in a sport where there can be excessive force to the mouth area should consider a mouth guards. Mouth guards are normally fitted to the upper teeth to provide protection to the teeth and jaw joint. The Velscope is a light based detection system that stimulates natural fluorescence in the soft tissue of your mouth. The Velscope is an oral cancer detection system which allow us to see areas of disease not visible with the naked eye. Tobacco use along with alcohol, are among the leading causes of oral cancer. Human papilloma virus (which is often associated with cervical cancer) has been showing up in increasing numbers of oral cancer cases as well. A biopsy is recommended to give a definitive diagnosis, but the Velscope can be the first step in early detection. When a small amount of tooth structure is missing due to decay, wear, or chipping, a filling is used to repair the damaged tooth. We call these fillings composite resins. The filling is bonded to the tooth and is sculptured to replace the tooth's original form. Dental composites are made of a mixture of glass and plastic, people also refer to them as white fillings. Composite fillings are a little more expensive than those made of amalgam, but they're less noticeable, so many people prefer them. Composite fillings resemble teeth in color, and we can add hues to render them an almost exact match to your natural teeth. A root canal is needed if the nerve in the canal of the tooth becomes inflamed or infected because of a deep cavity or trauma. This procedure is the removal of the nerve from the canal. The canal is cleaned, rinsed and a filler is placed inside. This procedure allows for the removal of pain and for the tooth to stabilize for restorative purposes. If this process isn't done when required, tissue surrounding the affected tooth may develop an infection, leading to the formation of abscesses or tooth loss. An extraction may be required if a tooth cannot be restored. This is the removal of the entire tooth. The tooth often times has loss of supportive strength due to a large cavity with infection, trauma, or a crack onto the root area. Wisdom teeth often require removal depending on their location and angulation.